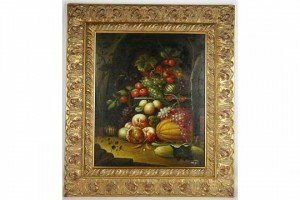 A 16th century style oil painting of still life summer fruits, contained in a heavily carved gilt wood frame. 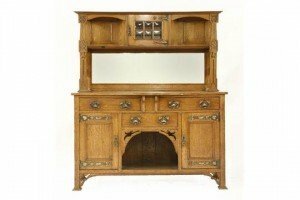 An Arts and Crafts oak dresser, with a mirror back below a glazed cupboard and flanked by shelves, over a bow front with an arrangement of drawers and cupboards around a built in dog kennel. 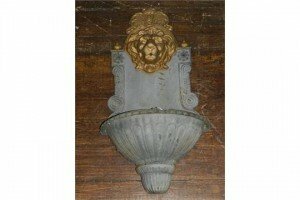 A late 19th century cast iron wall mounted water feature, incorporating a lion mask above a semi-circular gadrooned bowl. 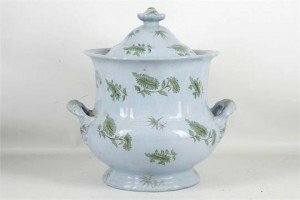 A mid 19th century twin handled water bowl and lid, a pale blue background with green and gold flower and foliate design. 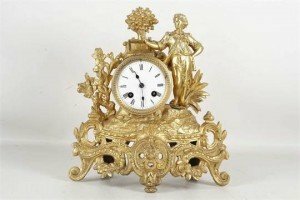 A full metal French rococo style mantel clock, with a figure of a gardener resting on the drum clock, with striking movement which has Roman chapter. 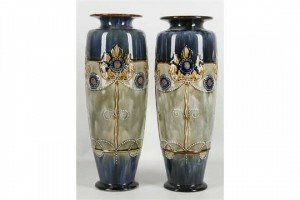 A pair of 20th century Royal Doulton stoneware baluster vases, decorated with stylised art nouveau flowers in shades of green, blue and brown. 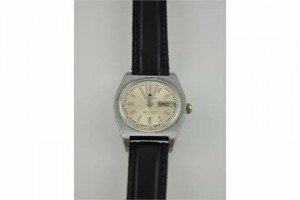 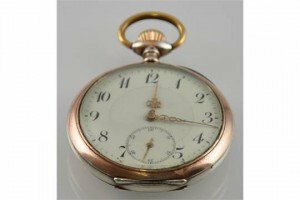 A vintage Buren gentleman’s manual brushed stainless steel wristwatch, the dial set with minutes and seconds in Arabic numerals and day/date aperture at three, on black leather strap. 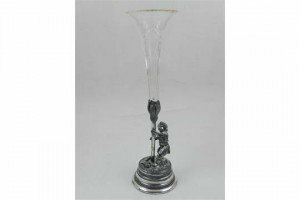 A late 19th century silver plated and cut glass stem vase, the trumpet shaped vase with a support modelled in the form of a young child. 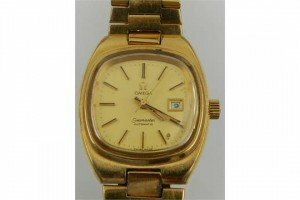 An Omega Seamaster ladies gold plated automatic wristwatch, the case of curved square form, on an articulated bracelet with fold-over clasp, the dial with baton markers and date aperture. 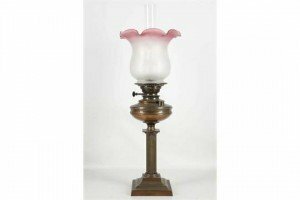 A fluted column brass oil lamp on a square terraced base, fitted with an etched and frosted glass pink shade. 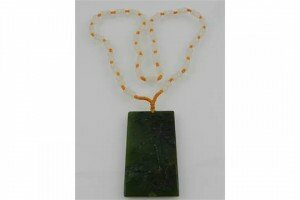 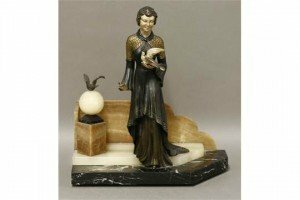 An art deco marble and onyx table ornament, mounted with a patinated speller figure of a woman holding a dove. 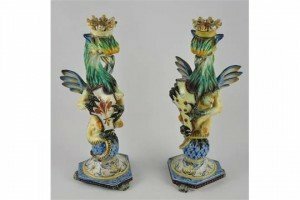 A pair of late 19th century Italian majolica candlesticks, modelled as crowned griffins with their wings spread. 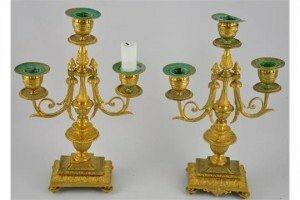 A pair of neo candlesticks style gilt brass 3 branch candlesticks with scroll arms on acanthus cast rectangular bases. 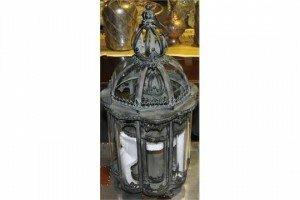 A large octagonal formed vintage cast iron lantern, inlaid with glass panels down each side. 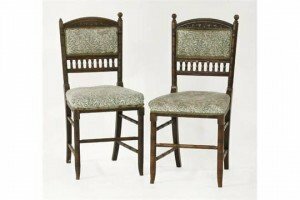 A pair of aesthetic rosewood hall chairs, the turned supports with an arched top rail carved with shamrocks. 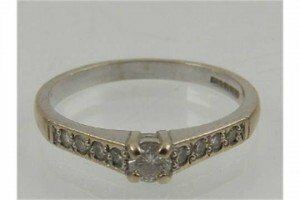 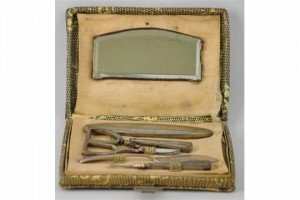 An art deco standard silver part manicure set, in the original faux lizard case, the silver marked 800.